. : Optics & Photonics Focus :: Upconversion Reloaded :. Red light turns blue. 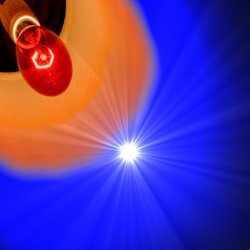 In Dam and colleagues’ experiment, the red emission of a light bulb was converted into blue using a nonlinear crystal inside a laser cavity. After the conversion, the blue image was captured with high resolution using a standard CCD camera. A rattlesnake is moving relentlessly through the dark night, towards a blissfully unaware of the danger mouse. It is just a matter of seconds before the hunt comes to an end and the snake’s hunger is satisfied. Thanks to special infrared-sensitive eyes, some species of snakes are formidable predators in the dark, being able to see the heat emitted by small animals. In our technological word, infrared cameras can also have many civilian and military applications, and can be used, for example, to improve night vision, navigation and surveillance. Jeppe Seidelin Dam and colleagues at the Technical University of Denmark (Roskilde, Denmark) have now significantly improved the efficiency of upconversion imaging, an old, almost forgotten technique that makes possible the wide use of light technology for infrared imaging. Nowadays, the technology for the detection of infrared light is typically based on special materials that are different from those used to detect visible light. In terms of wavelength, infrared radiation is just above what the human eye can see: our eyes, in fact, typically respond to wavelengths from 390 (blue) to 750 (red) nanometers. The near-infrared window, from 750 to 1400 nanometers, lies just above this portion of the electromagnetic spectrum, while the mid- and far-infrared windows, from 1400 nanometers to 1000 micrometers, are far beyond it and include most of the thermal radiation emitted by objects near room temperature. "Cameras for the visible and near-infrared regions, based on silicon-detector arrays, have been developed and optimized for imaging purposes for decades," explains Dam. "Unfortunately, the sensitivity of these detectors drops dramatically as the wavelength is increased beyond 1000 nanometers. Silicon-based detectors for visible and near-infrared light feature near single-photon detection capability, whereas detectors for mid-infrared light require at least thousands of photons to get clear of the noise floor." Upconversion imaging is an old technique, proposed in the 1960s, to convert an infrared image to the visible range: the infrared radiation, after being mixed with a strong laser beam, is converted by a nonlinear crystal into a visible signal that any standard light technology can potentially detect. In the ’60s, detecting infrared images of thermal origin was of enormous military interest: the absence of good detectors in that range, therefore, incentivized the research on upconversion. This field, however, was soon abandoned, partly due to the low efficiency of the method and party due to the development of other, more efficient infrared detectors. In those early studies on upconversion, only a photon over five million was detected — several orders of magnitude below the threshold of today’s standard detectors for infrared light! "One of the main reasons for the poor efficiency of the early systems," Dam points out, "was the nonlinear crystals used for the photon conversion, which at that time were of poorer quality compared to what is commercially available today, both in terms of efficiency and losses." Upon recovering the old theories from the ’60s about upconversion, Dam and colleagues were able to find out how to increase the efficiency of the process by three orders of magnitude. "The main feature of our technique is that it allows us the use of regular cameras to capture infrared images. Since regular cameras have high sensitivity and produce low intrinsic noise, the potential for more sensitive imaging in the infrared is high." In their experiment, the red emission of a light bulb, once converted to blue, was imaged with high resolution using a standard CCD camera. Inside a laser cavity, a modern non-linear crystal generated a blue photon for every five thousand red photons coming from the bulb. "This efficiency could still appear weak," Eric Lantz at the Université de Franche-Comté (Besançon, France) points out, "but it is a record for an incoherent image issued from a lamp that must be converted with a continuous wave laser." Despite such significant improvement in efficiency, the technique still needs further development in order to be able to compete with modern infrared detectors. "Performances of infrared detectors remain much lower than those of silica detectors in the visible range," adds Lantz. "Hence, upconversion imaging could be, in principle, an interesting alternative. However, the conversion efficiency should be further improved by orders of magnitude." According to Dam, the method has room for improvement, and higher efficiency can be achieved. "A quantum efficiency of the wavelength conversion process of the image in the order of a few percent would be enough to give a good signal to noise ratio for many applications. Theoretically, it should be possible to obtain near 100% conversion efficiency of a polarized light source." This work shows how an old, known but forgotten, technique can be brought back to life once the scientific progress is mature enough, thus offering valid alternatives to a whole range of established applications. With this technique, for example, "it would be possible to take images of the thermal radiation of hot surfaces using a standard camera, like the ones found in today’s mobile phones, together with the wavelength conversion module," Dam envisions. "Our technique, therefore, may offer a simpler and cheaper option for infrared imaging within combustion processes, food analysis, medical imaging, and crop surveillance, to mention but a few." Jeppe Seidelin Dam, Christian Pedersen & Peter Tidemand-Lichtenberg, High-resolution two-dimensional image upconversion of incoherent light, Optics Letters (2010) 35, 3796-3798 (link).